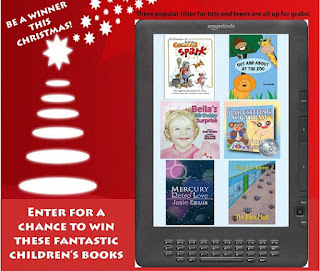 From the 1st to 7th December 2012 people can enter this awesome give-away and be in with a chance of winning a selection of fantastic children's titles. The contest is international and all people have to do to enter is click through the rafflecopter (see below). The more you click, the more entry votes you have and the better your chances of winning. I'm joined by authors; Kate Mueller, Ngaire Elder, Virginia Jennings, Janie Emaus and VS Grenier to offer some pre-Christmas fun and give readers the chance of winning a copy of our books. An excellent prize that can be downloaded directly to your kindle device. No waiting for the postman to deliver! Reading is an important skill for children to learn and electronic reading devices like kindles are opening up the possibilities of getting children to read more. Ideal for those times when you need to entertain them in waiting rooms or during long journeys but also great for reading at home. This super prize will keep the younger members of the family entertained either independently or as a group activity. I was trying to think up ways I could promote my book in the lead up to the holidays and give a little something back to all the people that support my work. I figured it would be more fun to include other authors in the children's genre and do it as a group project than to go it alone and so asked some of my colleagues if they wanted to join me. The result is a fabulous prize of titles suitable for tots to teens. The winner of the give-away will receive a copy of each of the titles giving them an instant library of children's books for their kindle... and just in time for the holidays! Each day this week I'll be sharing with you some more information about each of the titles up for grabs and their authors so be sure to check back. What a great thing to support literacy!